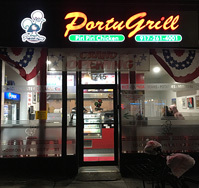 Fire-grilled chicken with piri piri sauce, Portuguese sausage and grilled churrasco (skirt steak) is what you will find at PortuGrill on the Upper East Side. Each can be purchased a la carte or as a meal. Sides include lime cilantro quinoa, roasted potatoes, grilled vegetables and fire grilled pineapple. For dessert there is Brigadiero cake, a traditional chocolate fudge cake. Space is limited with just some counter seating.